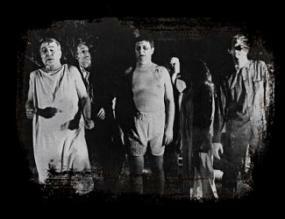 Night of the Living Dead does not open with the classic line, "They're coming to get you, Barbara! ", but it is when this line is delivered by Barbara's sadistic brother Johnny that the movie really gears up and gets started. This horror movie opens with a shot of a car moving along a winding road toward a cemetery, and as audiences watched that car drive along for the first time in 1968, they had no idea what they were in for. This is THE movie. The Big One. The King of the Zombies. The movie that started it all. 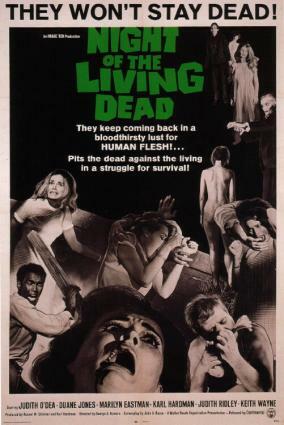 Although Night of the Living Dead was shot on a shoestring budget (about $5,000 which, even by 1968 standards, was not much at all) and featured no recognizable stars (the entire cast and crew consisted of people George Romero knew from in and around Pittsburgh, PA), it managed to single-handedly alter what could and couldn't be done in the movies. It also changed the horror genre itself forever. The movie industry owes an entire sub-genre to this film. Video game fans owe it Resident Evil - a game which was heavily based upon this and Romero's other zombie movies. Romero owes it his career. The film has a very basic plot. Several people have barricaded themselves inside an old farmhouse in an attempt to escape the rotting corpses of human beings which have been inexplicably reanimated. The zombies are literally bloodthirsty, not only attacking the living but feasting on them as well; the fact that truly drives the horror aspect of the film home. Although the people share a common enemy (the zombies), it is actually human nature itself that brings about their eventual undoing and ultimate demise. What really made Night of the Living Dead such an influential movie is the way it managed to shatter multiple movie taboos in one fell swoop. Even today, we don't often find themes of cannibalism, matricide, and a total lack of respect for the deceased in one movie, but these hot buttons and others are all firmly pressed by Romero's 1968 effort. On the surface, the movie is nothing more than a low budget horror movie with some before-their-time gross-out sequences. Scratch that surface just a little, however, and you'll find the movie has a somewhat deeper political message. "I wanted to make a movie about a new society that is devouring, in this case quite literally, the old one," Romero has said of Night of the Living Dead. Released at the height of the hippie movement and the most volatile year of the Vietnam War, Night is Romero's commentary on the state of American culture at the time. In addition to this main theme, Night succeeded in breaking new ground by putting an African-American, Duane Jones, in a lead role and making him the true hero of the film. This was just not done at the time. There were certainly films with black characters acting alongside whites and even upstaging them, but none that put the black man in a role like that of Ben, the one character who we really want to root for. The white characters are weak, cowardly, inexperienced, and annoying by comparison. Another interesting side note is the fact Ben is black is not once brought up in the film. Even when Ben is locking horns with Harry Cooper (Karl Hardman), the "N" word is never used (something that would have been easy to do at the time) and the "race card" is never played. The character was written to be a white man, and when Romero decided to cast Jones, it was never rewritten for a black actor. It was a stroke of genius on Romero's part, as adding racial tension to the mix would have overshadowed the real message of the film. We still imagine that Cooper is the kind of man who would use the "N" word but doesn't for fear of reprisal from the other characters. Night of the Living Dead spawned a host of sequels, remakes, and imitations in the years that followed its release. Romero has managed to maintain the zombie crown, however, by directing all the sequels himself and maintaining the rights to the franchise (if not the movie itself). 1978's Dawn of the Dead, 1986's Day of the Dead, and 2005's Land of the Dead are fine movies, but this will forever be remembered as the movie that started it all.